A village in Aylesbury Vale appears to be the target of an unusual online craze - where people attach slices of bread to unusual locations. There have been reports of slices of bread found attached to signs, postboxes and noticeboards in Stewkley. 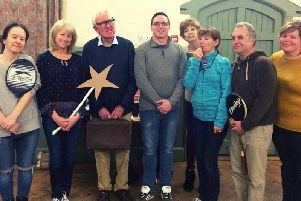 Stewkley resident and Bucks Herald reporter Neil Shefferd said: "About a week or so ago I noticed a slice of bread was pinned to the Stewkley Village Hall noticeboard. "I removed it from the board, disposed of it and thought nothing more of it. "I then learned that it was not an isolated incident and slices of bread had been put up in other places in the village. "It's very strange, personally I'm not sure what to make of it, but it's not doing anybody any harm." The photo above shows a slice of bread taped to the side of a postbox on High Street South, while other reported sightings of bread have been at a bus stop on Soulbury Road and on one of the village entrance signs. This craze reportedly stems from a virtual online community called Bread Stapled To Trees who have almost 150,000 active members. As the name implies, members go around stapling bread to trees and sharing photos. Since the formation of the group, the craze is being extended from trees to other unusual locations. Has this bread-stapling past-time hit your area of Aylesbury Vale? E-mail your stories to neil.shefferd@jpress.co.uk.